With market jitters over Greece receding, Goldman Sachs is advising clients to load up on European stocks at the expense of U.S. assets. The investment bank upgraded its short-term view on European equities to "overweight" from "neutral" in a note dated July 20, which cited the recent deal to start negotiating a new Greece debt package as one of the reasons for a more positive view, and downgraded U.S. equities to "underweight" from "neutral". The euro's weakness against the dollar, the European Central Bank's quantitative-easing program and accelerating economic growth should fuel European stocks' outperformance versus U.S. stocks, the note said. The STOXX Europe 600 has rallied nearly nine percent in the last two weeks, as an impasse between Greece and its creditors was broken and they agreed a cash-for-reform deal. "European equities have been one of the key asset classes to benefit from a fading of Greek risks," Goldman Sachs strategists said. "While performance potential might be limited in the near-term after the strong rebound, several supportive fundamental factors should help outperformance of European vs. U.S. equities until year-end." Blame poor rains or a lack of weddings, but Indians, for whom gold is the investment of choice, aren't rushing to buy bullion after this week's sharp sell-off. India and China are the world's top gold buyers and, after massive selling on the Shanghai Gold Exchange on Monday helped drive down gold prices by 4 percent to a 5-year low, traders hoped demand would perk up in India, or elsewhere in Asia. The last big slide in gold prices - a 13 percent drop in just two consecutive trading days in April 2013 - prompted weeks of long queues of Indians outside gold showrooms. Not this time. India's gold appetite - it accounts for more than a fifth of global demand - remains sluggish, with only modest local premiums to the global spot benchmark. "That's really a bearish sign, when the main consuming region remains on the sidelines after such a price drop to a multi-year low," Commerzbank senior oil analyst Carsten Fritsch told the Reuters Global Gold Forum on Tuesday. "Who's going to buy gold if not the Asians?" 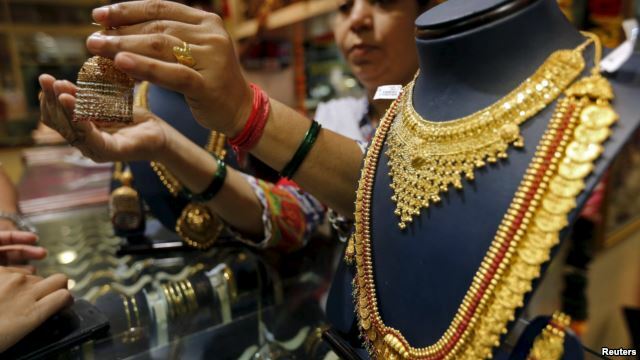 As the gold price dropped on Monday to $1,088.05 an ounce, its lowest since March 2010, Indian jewelers sent text messages to clients encouraging them to buy gold and offering to cut by half the cost of making it into jewelry. While the price slide sparked some interest, there has been no repeat of the 2013 buying frenzy. "This is not a festive or wedding season, so interest remains low," said Kumar Jain, vice president of the Mumbai Jewellers Association. This year's Hindu calendar has fewer auspicious dates for weddings, a traditional time for buying and giving gold. The Indian central bank's inflation targeting efforts have helped bring price rises under control, removing one main reason for Indians to hold gold as a store of value. The rate of inflation has halved to 5.4 percent from double-digits at the end of 2013. India spent a record $15.2 billion on gold imports in April-May 2013, with gold bars selling locally for more than $20 an ounce above the global spot price. That premium is now just around $1 an ounce. "Many Indian consumers are not buying, thinking there's still scope for downside in prices," said Daman Prakash Rathod, a director at Chennai-based wholesaler MNC Bullion. And weak monsoon rains mean many farmers from India's rural areas, which make up nearly two-thirds of domestic gold demand, don't now have the ready cash to buy gold, Rathod noted. Morgan Stanley estimates Indian households own, directly or indirectly, around $1 trillion in gold, about the same as in bank fixed deposits, and against just $400 billion in shares - though low-cost stockbrokers are looking to use a 42 percent drop in gold prices over the past four years to lure investors into buying more shares. The lackluster physical demand for gold is mirrored elsewhere across Asia, with premiums in Hong Kong up by just 10 cents from last week to 90 cents-$1.10 an ounce and those in Singapore stuck at around $1 for months, traders said. "There was a bit of buying and then no more inquiries. Gold prices are dropping, dropping, dropping - so people don't want to buy for the time being," Ronald Leung, chief dealer at Lee Cheong Gold Dealers in Hong Kong, said on Tuesday. Bullion prices generally have come under pressure from expectations of higher interest rates in the United States, which boosts the dollar and makes non-interest bearing assets such as gold less appealing. China revealed on Friday a 57 percent increase in its gold reserves from 2009, far less than the market had estimated. And even if gold prices fall further - spot prices rose about 1 percent to $1,109 an ounce on Tuesday - there's no guarantee that would encourage buyers. "If gold falls below $1,000, would there still be interest in holding gold?" asked a Singapore-based trader.